Grass loves the fertile soil in this garden bed. Why might you want to use permanent garden beds and mulch the path ways between the beds? I have done some reading about the benefits of permanent garden beds and I’m convinced they are a good idea. The main benefit of permanent raised garden beds is that they do not need to be tilled. This is because the beds are never walked on, preventing soil compaction. Instead, path ways are used to provide access to the garden. When making a case for permanent garden beds, people often recommend mulching the paths between the beds. This seemed like extra work to me, so I just let the grass grow between the beds. 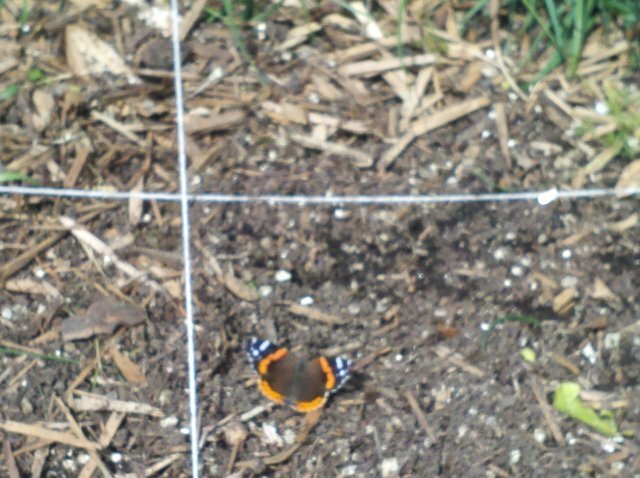 This butterfly visited the garden while I was pulling weeds. This is my third year using raised beds and square foot gardening. The first picture shows the reason mulching between garden beds is a good idea. The grass will infiltrate the garden bed from the sides and act like a weed in the garden. After pulling grass out by the roots, I think mulching between the beds might be less work. 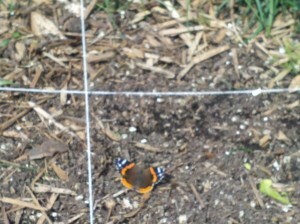 Luckily, it was a nice sunny day and I had visitors while pulling the weeds. I snapped a picture of the one you see to the right. The garden bed after weeding. The picture to the left shows the results of digging in and getting my hands dirty. 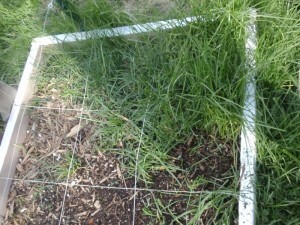 The grass was easier to pull than if it had been in the lawn because of the loose garden soil. In the end I got to spend time out doors, digging in the dirt and enjoying the sights and smells. It reminded me that this is a great time of year to be out in the garden because the mosquitoes are not out attacking me. Soon I will top this bed up with compost. 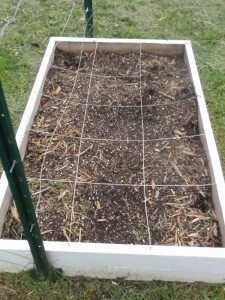 Then I will decide what to plant in it in addition to the radishes I plan to start with.